The growth of urban areas, characterised by extensive impervious surfaces and limited vegetative cover, has altered the natural water balance leading to a much greater discharge of waste water and poor quality runoff. Infiltration into ground water is reduced and quality may also be degraded due to the presence of pollutants, which in turn damage aquatic habitats. Limited tree cover reduces water storage in root systems, the release of water into the atmosphere through transpiration, and natural pollution filtering through tree roots especially. As a consequence, increased attention is being paid to managing the water cycle in urban development. Often referred to as Water Sensitive Urban Design (WSUD), this is an alternative approach to traditional stormwater management. It seeks to minimise the extent of impervious surfaces and mitigate changes to the natural water balance through on-site reuse of the water as well as through temporary storage. Key principles include integrating stormwater treatment into the landscape, protecting its quality, and reducing runoff and peak flows. Green building techniques also aim to reduce the impact of buildings on the environment and human health. The use of renewable resources is emphasised including harvesting rainwater from roofs and using plants and trees to reduce rainwater runoff and improve the quality of water flowing into streams and natural courses. Other techniques involve the use of permeable surfaces to enhance the replenishment of ground water. Water harvesting tree pit systems to provide adequate soil volume and capture stormwater runoff – reducing flooding, removing pollutants, and providing passive irrigation for urban trees. Surface drains which capture water through drainage grades and direct it to the root zone of trees where the water may be absorbed into the surrounding subsoil or by the trees’ root systems. 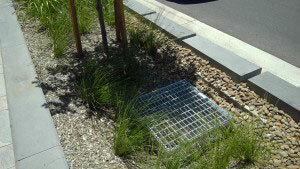 Rain troughs which incorporate plants that collect and break down pollution and contaminants carried by surface water. Integrating drainage pits into the kerb and gutter, with appropriate methods to deal with pollutants. Permeable pavements and tree pit surfaces which enable water to flow freely into the root zones of adjacent trees, for absorption. Roof water discharge, typically cleaner than road runoff, which is harvested from nearby buildings and piped to the root zones below the pavement. 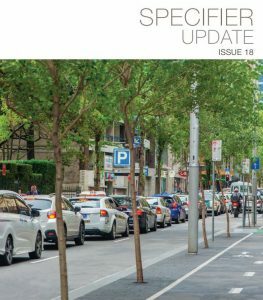 Increased use of trees in urban design to slow water runoff. Via these methods, stormwater discharge is delayed or reduced (as is the risk of flooding), pollutants are filtered out, and trees obtain the benefit of rainwater delivered to their root systems. In addition, the drought problems predicted to result from climate change may be mitigated.